Trevor is a new OW diver! Congratulations to Trevor for completing his PADI Open Water Diver course through e-Learning with Roatan Divers! Trevor was here on holiday with some of his friends who were already certified and by completing all his knowledge in advance through e-Learning this meant he could start in the water right away. He was a natural in the water and quickly grasped the underwater skills needed as part of the course. Next, it was on to diving in the open ocean at several of our nearby dive sites. Although weather conditions were a bit choppier than normal, Trevor was up for the challenge and we were able to complete his four open water dives. Next thing you know, Trevor was an Open Water Diver! Well done, great work! Kudos to Kevin and Dave for completing their PADI Advanced Open Water Course with us. 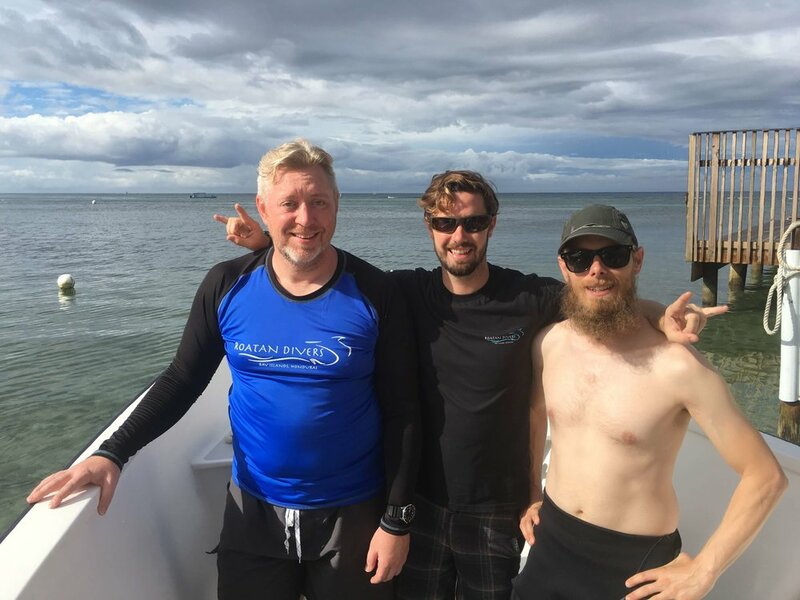 Dave and Kevin were visiting Roatan for the first time and were relatively new divers who wanted to improve their diving confidence and skillset. They did 5 Adventure Dives as a part of their course which focused on improving buoyancy, how to dive deeply, safely, underwater navigation, drift diving and went on their first night dive! It was a pleasure getting to know both of them both in and out of the water. We are excited to see where they will be applying their new diving skills to next! Great work Kevin and Dave! Gabriel is an Open Water Diver! Gabriel became an Open Water Diver! Congratulations to Gabriel for completing his PADI Open Water Diver course with Roatan Divers! Gabriel first started diving with us a few weeks ago while his family was here, a bunch of them decided they wanted to try diving for the first time by completing their Discover Scuba Dive. While most of his family headed home, Gabriel remained here in Roatan doing mission work that gave him the extra time needed to pursue his full Open Water certification. 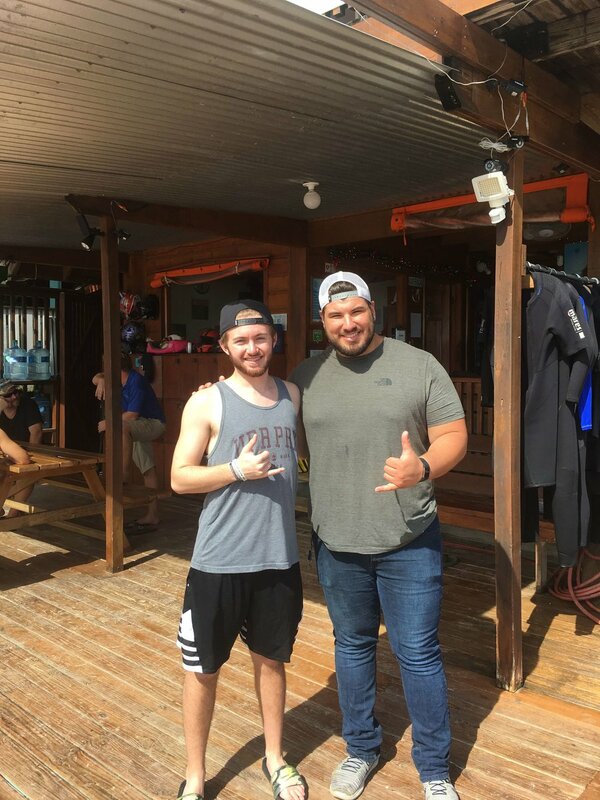 We loved seeing Gabriel go from try diving out to deciding he was ready to become a fully certified diver! He did a great job mastering all of the shallow and deep water skills required to become an Open Water Diver. By the end of the course, he was becoming more and more comfortable in the water. Joshua tried scuba diving along with his friend Gabriel! Joshua who is here in Roatan traveling with his friend Gabriel decided he wanted to try our Discover Scuba Dive experience. Gabriel had already started his full Open Water Course, but since their trip was nearing an end, Joshua was short on time. Trying diving was a great opportunity for him to go diving and experience for himself what Gabriel had been telling him about! We did a long briefing on the essentials of diving, practiced some key skills in shallow water and then it was time to go diving! For this dive, they only went to a maximum depth of 40ft but there was nice, clear visibility that day. They both had a great dive and saw loads of underwater life! After the dive, Joshua could easily see why Gabriel got hooked and now Joshua hopes to pursue his Open Water certification someday soon! Well done Joshua! Our next two graduates Pascal and Kristina completed their PADI Advanced Open Water course with us. Visiting Roatan from Montreal, they asked if we had an instructor who could teach in French and we were happy to oblige! It was fun teaching them all about deep diving, drift, under water navigation, buoyancy and even going on their first night dive together. On their night dive, they saw a very strong bioluminescence presence which here Roatan is often referred to as the "String of Pearls." This once in a lifetime experience is truly magical! Welcome to the RD Graduate Family Kristina and Pascal! Kristyn was so excited after going diving for the first time! Kristyn is here in Roatan to visiting her friend who calls Roatan home. She had never tried diving before, but since her friend Kristin is a certified diver, Kristyn decided our Discover Scuba Dive experience was perfect. To start we spent time teaching her the basics of how to dive safely before starting out in shallow water to get comfortable with the equipment and taking her first breaths underwater! From there we took Kristyn and Kristin out to one of our local dive sites to let them see the beautiful reef that Roatan has to offer. They had an amazing dive with eagle rays, turtles and so much other marine life. Kristyn loved her first time underwater and was filled with excitement! It was our pleasure to get to take her diving for the first time, but surely won't be her last. Well done to all of our PADI graduates this week. It was a pleasure teaching all of you and we hope to see them all continuing their diving adventures!